We Help Our Atlanta Dental Patients Maintain Healthy Smiles—Or We Create Completely New Ones! Welcome to the Internet home of Jackson’s Dental Center. I’m Dr. Montina Jackson, and I have been practicing general and family dentistry in Atlanta since 1989. My goal is to help my patients have beautiful, healthy smiles and maintain them for a lifetime. With the help of my carefully chosen, friendly, and dedicated staff, I will provide you with gentle, caring, state-of-the-art general dentistry in a relaxed, family-like atmosphere. Also located in my recently remodeled building is Jackson Dental Laboratory, operated by my husband, J. Jackson, Sr. My husband is a master dental technician who specializes in creating comfortable and natural-looking dentures and partial dentures. We work together to make certain our patients have affordable, natural, attractive, and functional smiles. We understand what a terrible inconvenience it is to be without your teeth, even for short periods of time. With Jackson Dental Laboratory on premises, in most cases, we are able to offer same day expert repairs for your existing dentures and partial dentures. Don’t delay your dental care another moment. Call us at Jackson’s Dental Center. We’ll take care of you—and give you a reason to smile again! Personalized care. It’s the difference between just a dental appointment and a visit with a trusted professional. 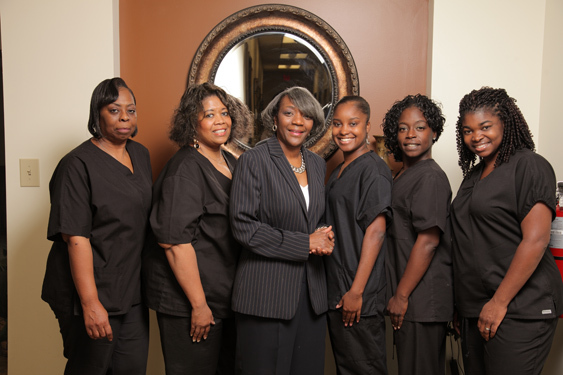 In Atlanta, our team at Jackson’s Dental Center is dedicated to bringing you the care you deserve at every visit. When you become Jackson’s Dental Center patient, you become a part of our practice family, and we will treat you with the compassion and care you deserve. We will listen to your concerns and develop a customized treatment plan with the best solutions for your unique smile. Our Atlanta general and restorative dentistry practice focuses on providing you with your healthiest and most beautiful smile possible. Our dental team is highly trained to ensure your comfort during your visits with us. We offer preventive, modern treatments, along with conservative techniques such as bonding (white fillings) to preserve your smile. Crowns and bridges are also offered to both strengthen and replace missing teeth in a very natural-looking fashion. At Jackson’s Dental Center in Atlanta, GA, our passion is caring for your family. We see patients at every stage of life, and we can provide you and your loved ones comfortable, beautiful, and functional smiles. If you have few or no remaining natural teeth, you’ll benefit from a denture or partial denture to replace your missing, damaged, or diseased teeth. We frequently help patients who are dissatisfied with their existing dentures or partial dentures. So, if you have loose or ill-fitting dentures, the experienced, friendly professionals at Jackson’s Dental Center can replace them and give you a beautiful new smile! We are proud to have Jackson Dental Laboratory onsite for your convenience. Jackson Dental Laboratory creates state-of-the-art, natural-looking dentures and partial dentures. The owner, J. Jackson, Sr., happens to be Dr. Jackson’s husband. With Jackson Dental Laboratory on premises, you can be assured that your case will receive the personalized attention of both Dr. Jackson and J. Jackson, Sr., the laboratory owner. This unique collaboration assures you will receive the most natural-looking and best-fitting dentures and partial dentures possible. Receive same day service on most repairs of your existing dentures and partial dentures! Are you ready for a beautiful, healthy smile? Contact our Atlanta family and restorative dentistry practice for your appointment, consultation, or second opinion visit. Experience friendly, attentive treatment, and find out how Dr. Jackson and the team at Jackson’s Dental Center can transform your smile.